• Miss Payton Michelle Coxe is a freshman and a first year member of the court. She is a freshman cheerleader at Central High School. 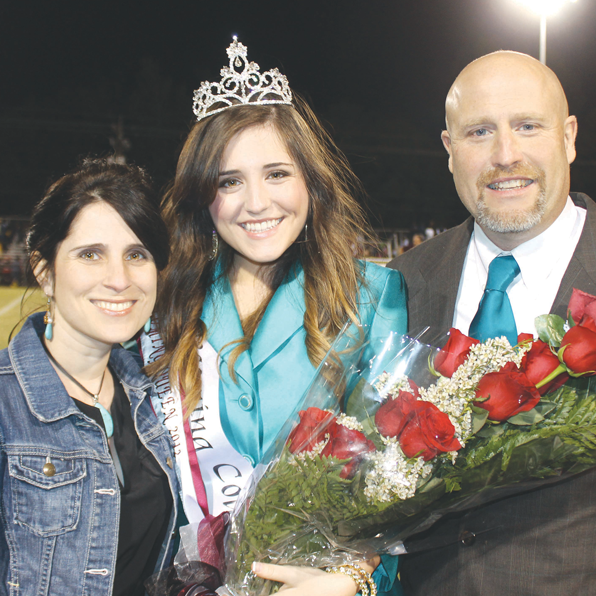 • Miss McKenzie Knapps is a freshman and a first year member of the court. She enjoys singing, writing music, hunting, fishing, playing basketball, and playing the guitar. McKenzie says music is her life but God is her everything. • Miss Serenity Lanclos is a freshman and a first year member of the court. She enjoys dancing and spending time with her friends. • Miss Tobi Baudry is a sophomore and a second year member of the court. She is a member of the varsity girls’ soccer team, junior varsity cheer squad, and the 10th grade leadership team. • Miss Morgan Blanchard is a sophomore and a first year member of the court. She is a member of the Beta Club, youth and government, 10th grade leadership team, and the JV cheer squad. • Miss Yuri Ma. Yuri is a sophomore and a first year member of the court. She is honored to be a part of this year’s court. She is attending CHS as a part of the student exchange program. Her host parents are Danny and Sara Allen. Yuri enjoys playing the piano and cooking. Her favorite pastimes are spending time with friends and eating chocolate. • Miss Rebekah Ann Phillips is a sophomore and a first year member of the court. She is a second year member of the Best Buddies Club. Rebekah is an active member of the Youth Department and dedicated member of Comite Baptist Church. • Miss Blaire Bauer is a junior and a second year member of the court. She is a member of the varsity cheer squad, the Beta Club, and Best Buddies. • Miss Mallory Burns is a junior and a second year member of the court. She is a member of the varsity cheer team and the CHS track team. Mallory is a member of the Beta Club and Board Games Club. • Miss Jordan Gauy is a junior and a first year member of the court and a varsity cheerleader. • Miss Maggie Milstead is a junior and a first year member of the court. She is a member of the CHS Kittens dance team. • Miss Breigh Anne Allen is a senior and a third year member of the court. Breigh maintains a 4.0 GPA and is the president of Student Council and the Best Buddies Club. She is a member of the Beta Club and Youth in Government. • Miss Hannah Rae Ashford is a senior and a second year member of the court. She is a member and captain of the CHS Kittens dance team. Hannah is senior class vice president, a member of the Beta Club, a member of the CODA Dance Studio, and an active member of Journey Church. • Miss Kassidy Bezet is a senior and a first year member of the court. She is a member of the Best Buddies and the Bible Club. Kassidy is an active member of The Rock Church. • Miss Shelby Breckwoldt is a senior and a first year member of the court. She is the captain of the varsity cheerleading squad, treasurer of the Senior Class of 2013, and treasurer of the Student Council. Shelby is a member of the Beta Club and Best Buddies. • Miss Victoria Dixon is a senior and a first year member of the court. She is secretary of the Beta Club and an active member of Central Community Theatre. Victoria is a member of FCS, Bible Club, and Central High’s Thespian Troupe. • Miss Crystal Rankin is a senior and a first year member of the court. She is a member of the soccer team, the Student Lighthouse team, and Fellowship of Christian Students. Crystal is an active member of the Zoar Baptist Youth Group.